Rena as she appears in DanceDanceRevolution HOTTEST PARTY. 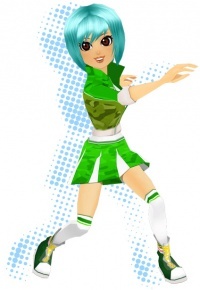 In earlier versions of DanceDanceRevolution HOTTEST PARTY, Rena was just EMI with a green outfit. Rena used to run the DDR FROM STAFF BLOG. character from the HOTTEST PARTY series in general to be included in arcade mixes. This page was last edited on 22 April 2019, at 13:44.